2380 - tell me WR2 that you are in! Redchilly - some wild moves in the last 2 days. What would negate the uptrend? Some profit taking probably on friday but what signs would be you looking for this to bounce to keep the uptrend in tact? i.e. 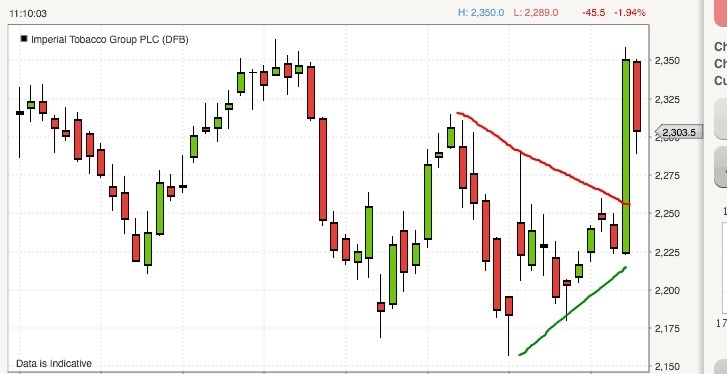 would you expect this to bounce on the 20 MA ? Look how perfect this short was. You cant get more accurate than that. was monitoring this for some time to see when the drop will stop. This gapped up today looks like a possible island formation, so one to watch. Last Edit: 01 Aug 2013 10:58 by ronnie. This is currently back testing the breakout point. A good shorting area will be the gap fill area. Based on a window it will be 2241.I prefer my own way which is the gap fill at 2253.This is where it gapped down from. Stop should be above 2270. Last Edit: 18 Jul 2013 08:13 by remo. I am already long on this. My initial entry was @ 2308 and SL was below 2275. SL is moved to profit and its a free trade. I will add to my Long position if it goes down to 2335 to fill the GAP. Last Edit: 21 May 2013 21:40 by redchilly. so maybe a bounce of the 2300 area that is 76.4 fib. That's the problem with trying to catch the breakouts....it can whip saw you in and out. The trend line is still intact. 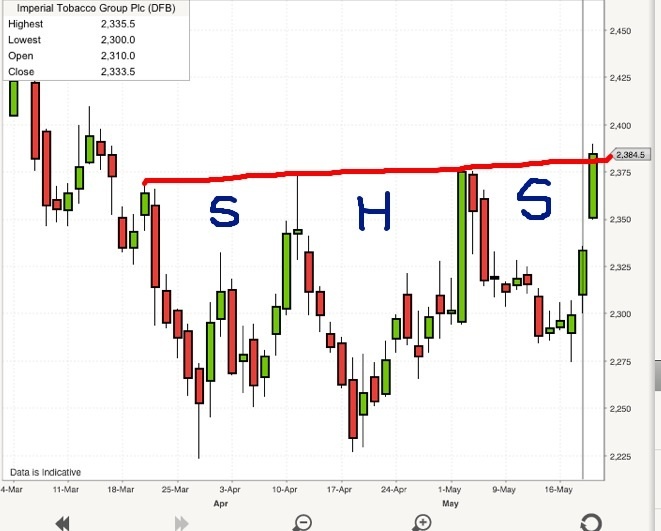 Imperial Tobacco, Long or Short? There was only one way to find out…. FIGHT! Seems Long / uptrend won! Remo - wouldnt the half way mark or the maruzubo line be a good place to short this? So i mean, allow this to move up another 50 points or so before getting your bazooka out and short it? Just a thought since today we have a long red candle and it has the tendency to go up and retest..at 2370 or so? The only part i dont like about this is the fact that its already moved 130 points today. Last Edit: 30 Jan 2013 13:01 by remo. Theres a big head and shoulder forming on this as well. The neck line is at 2255 so one to watch. 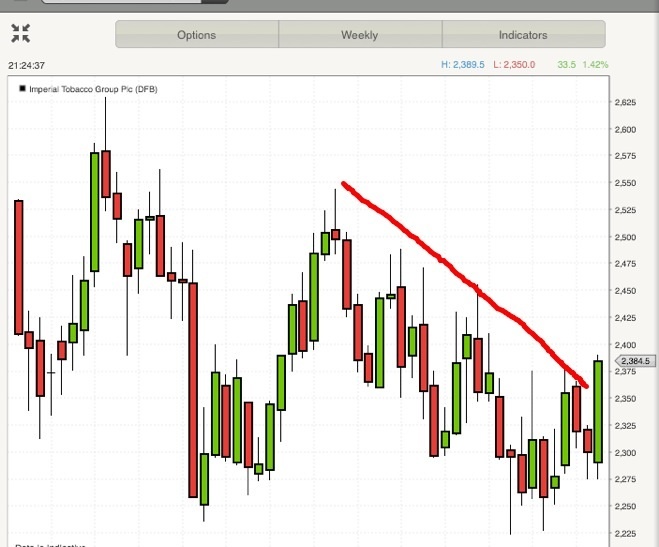 Theres a smaller head and shoulders as well which is the trend line were talking about which is still fighting this. Last Edit: 30 Jan 2013 12:41 by remo. Closed long, (break-even) gone short, after penetrated uptrendline. Remo said, could be a big drop. 5 Touches and now through. A sign of a good trend line . If you look at the chart from earlier you can see that this share has bounced of 3 times now from the trend line since it formed.So currently 5 points of touch. If this trend line breaks then lower prices should follow pretty fast. So now if it goes towards that trend line today dont re-enter as its been weakened for today. Thats why the first touch rule of mine is pretty good on important levels. Last Edit: 30 Jan 2013 10:15 by remo. 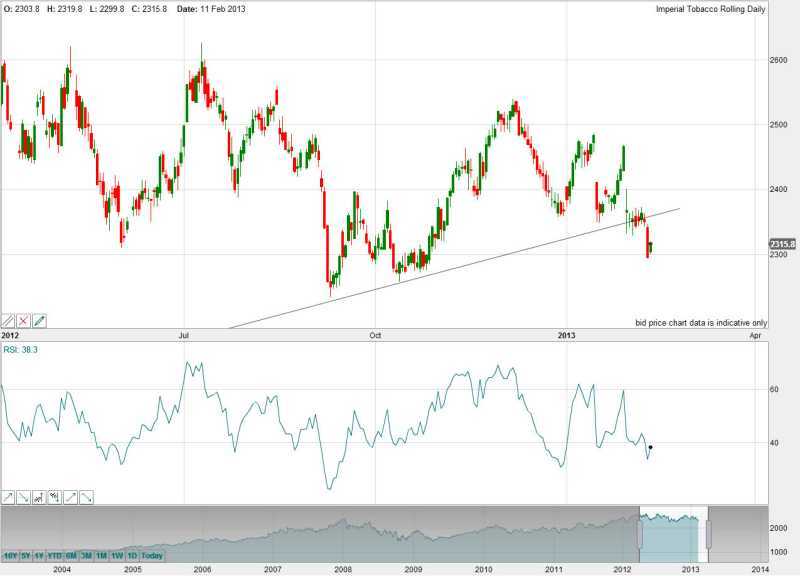 At support of long term uptrendline. Its bounced of the trend line nicely.Thats the power of a good trend line on a first attempt basis.Hense why i always go long on an uptrend line. It should be a free trade now. GL to you and Ronnie if you guys are already IN the trade! 2 Forms of support. Horizontal and Trendline. At 2351, give or take a few. Here's a chart, gapped down and approaching trend line. Last Edit: 30 Jan 2013 09:32 by ronnie.